O-Lynx provides a lot of great ways to enhance events when used with equipment like wired or radio controls. However, as outlined in my presentation …. …. using technology to make events more attractive can involve varying levels of sophistication with the first step just to have up-to-date results on a screen at the event. 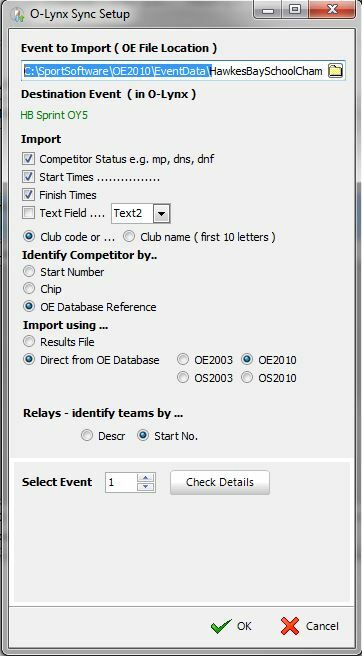 A clubs existing event software may be able to provide a results display, but it is also really easy to take advantage of the O-Lynx software with a few easy steps. 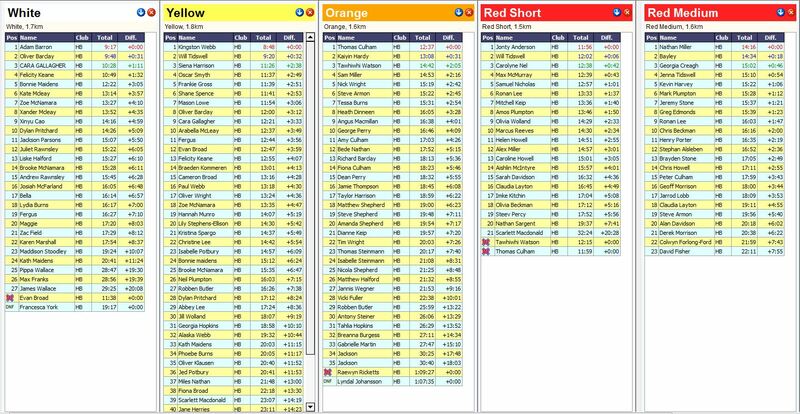 Easy to read and understand format with colour coded highlighting. Optional scrolling that gives you time to read the results but doesn’t take forever to show your result. 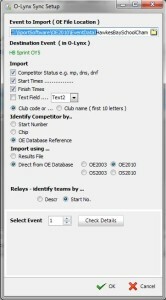 .. or show everyone at once with the ability to wrap competitors to a second results window. Ability to save a standard layout to be quickly used at similar events. Start times and elapsed times shown if pre-allocated start times are used at the event. Automatic updating of the results as they register and download. All competitors in the grade shown as soon as they register – its not only a list of finished runners. Easy to use whether its run on the same computer as the event software, or on a networked computer – no directory sharing hassles. To show the results with O-Lynx at an event …. Firstly we require an event to show so start up O-Lynx Event and click on the “Events” tab and the “New Event” button. Enter an event code and description. Finish the New Event Wizard by pressing “Next”, “Next” and Finish. That’s all we require in O-Lynx Event so it can be closed if you wish. We will be getting the information from OE software in this example, so O-Lynx Sync is needed to transfer the information. Start O-Lynx Sync from the icon that should be on your desktop. Click the setup button. You will see a window like that shown on the right. O-Lynx gets the event information by knowing what directory to look in, as setup in the “Event to Import” box at the top. Use the browse button to locate your events directory. If this is the first time you are using Sync then check it is importing competitor status, Start times and Finish times. Also it should be set up to the OE program version you are using. Press OK at the bottom to exit the setup window. Sync is now setup, so on the main Sync screen, press “Import Courses” and then “Start”. O-Lynx Sync will now be checking for new information every 30 seconds. Don’t close Sync as it needs to keep running during the event but you can minimise it if you wish. Now display the entries and results. Start-up O-Lynx Results and drag the main window to the screen you will showing the results on. Choose “New”, “Course Results” from the menu. A list of courses will appear. As shown in the green hint at the top, hold down the “Ctrl” or “Shift” key and select all the courses, then press the “Table” button at the bottom. A group of windows will appear bunched in one corner of the screen. Try using the “Window”, “Arrange All” or “Tile Horizontally” to arrange the windows. You can also manually adjust their position and size with your mouse or experiment with the “Layout”, “Adjust Width”/”Adjust Height”/”Full Height” options. You should now have a screen similar to the first image in this article. Hint : The title bar colour for each course can be set by clicking the blue down arrows to show the options menu for the results windows. It also is a good idea to use the “layout” “save” menu item to save the window layout in case you have to close the computer down at some stage or you wish to use the same layout in the future. All done. Now watch how this simple enhancement will have a huge impact on your events.